An example of a Chinese Sports Series pattern printed in blue underglaze without color added. 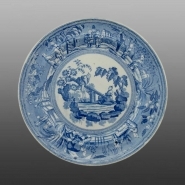 An earthenware platter printed in blue underglaze in an unidentified scene from the Chinese Sports Series. The pattern is also enameled overglaze in several colors. The platter's edge is enameled in brown. The Chinese Sports pattern is recorded as hand painted on bone china in c.1810 as pattern #539. Earthenware versions are found on both dinner ware and tea wares. Each piece in a service portrayed a different scene with children engaged in sporting games. In the central pattern here, the children are playing with a four-wheel cart. Minton used a narrow linear design for the border on holloware pieces such as on a tureen (also in this exhibit) and on tea wares. Other dinnerware pieces employed a wide border, as is the case with this platter, in which multiple sporting scenes are depicted. Based on known examples in this series, we can assert that the border scenes on this platter were used as central patterns on other shapes. The pattern should be considered one of a series. Priestman attributes the series to Minton due to its characteristic Minton shapes and to the documented pattern 539. See Priestman, Geoffrey H. An Illustrated Guide to Minton Printed Pottery 1796-1836. Sheffield, UK: Endcliffe Press, 2001, page 80.